San Francisco is a city of high-tech and startups, diverse restaurants and fun little neighborhoods, each with their unique spin. But, you only have a weekend. So what to do? Read on for my ultimate guide to San Francisco in a weekend! San Fran means mild climate all year round, though there tends to be regular rains between November and March. Typically, there can be significant weather differences in parts of San Francisco because of the city’s large hills and maritime location. Even on a sunny day, things can get chilly! Your best bet is to always carry a jacket, no matter what season. Combining the elegance and gentility of an Edwardian home, the Union Street Inn is the perfect pied-à-terre for those who want to explore San Francisco. With only 6 guest rooms, this is the perfect spot for anyone looking for comfort and intimacy in their accommodation. San Francisco’s most historic hotel, Palace Hotel, dates back to 1875 and is located in Downtown SF. At one point in time, it was the largest and most costly hotel in the world. It is still timelessly beautiful. Even if you don’t stay here, come for afternoon high tea in the Garden Court and a cocktail at the Pied Piper. Airbnb is also a great way to arrange accommodation during your visit and offers a variety of apartments and rooms for rent across the city at competitive prices. Sam’s Anchor Cafe (SF Staple Sunday Brunch): Across the bay, in Tiburon, this lovely cafe offers great seafood, brunch, and burgers, with lovely views out over the sea. 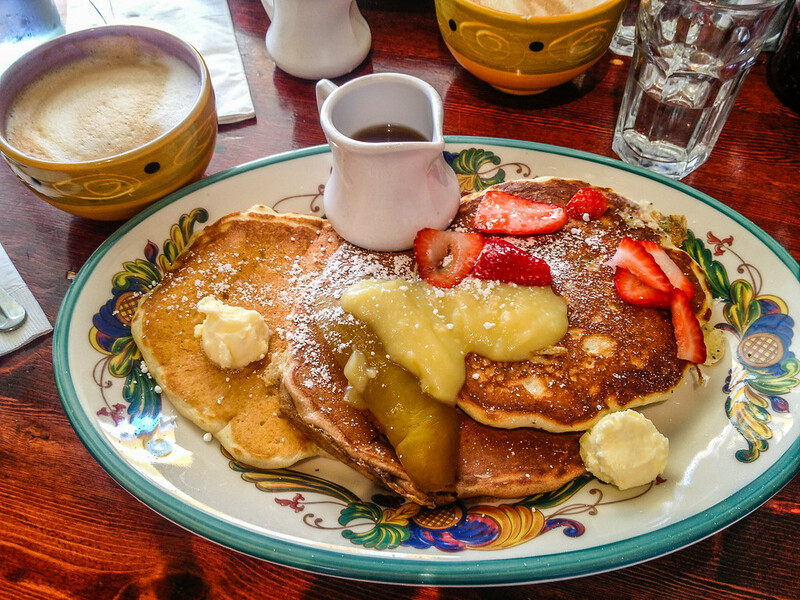 Take the blue and gold fleet ferry over to Sam’s Anchor Cafe for a perfect Sunday Brunch. Nopa: Nopa’s weekend brunch is a delightful change of pace from traditional egg and potato packed menus. And, you guessed it, you’ll need a reservation a week or two ahead of plans. Otherwise, try showing up 30 minutes before opening and you might be able to grab a seat at the bar. Mama’s on Washington Square: Gobble down your French Toast at Mama’s, a local favorite for 50+ years. Menu items include fluffy benedicts, homemade jam, fresh omelets, spicy Italian sausage, five types of French toast. The Golden Gate Bridge is the iconic landmark of San Fran and the north entrance into downtown. One of the best ways to see it is by bike, so rent a pair of wheels for a quick jaunt to Sausalito and back. A short walk south is Golden Gate Park, 1,000+ acres of beautifully cultivated gardens and home to the California Academy of Sciences. Ike’s Place in The Castro (Not Your Average Sandwich): Loaded with sauces, fillings and with an excellent range of sandwiches on the menu, Ike’s Place offers sandwiches large enough to satisfy the biggest of appetites. The Zeitgeist (Fun Beer Garden): The Zeitgeist is located in The Mission area of the city and features a nice outdoor area that is perfect for relaxing with a few pints. On days with good weather, expect the beer to be flowing and the garden to be packed with locals. Salumeria (Best Deli): Have your fill of fresh sandwiches and wraps at Salumeria, a tasty Italian bistro in the Mission District. Start off with an antipasto of cucumbers, pole beans, and preserved lemon—then go for the chili-caper egg salad, with Calabrian chili and kale chips. Swan Oyster Depot (Best Fresh Seafood): One of the best places for seafood in San Fran, this cash-only restaurant offers some of the best shrimp, oysters, and sashimi, all of which are freshly prepared. There are only around twenty seats so be ready for a long line to get in. Once you’re all filled up on goat cheese, try a walking tour of Mission Street’s famous murals. The neighborhood is colored with vibrant tapestries and graffiti that light up the alleyways and parking lots. You’ll start over in Balmy Alley with its Latino influences, then head down to Osage Alley, a vibrant splash of paint that stretches over two blocks. Jump onboard the ferry to Alcatraz, America’s most notorious prison. Guided tours are the best way to learn all about the famous inmates (including Al Capone), prison breaks, and general history on the island. The night tour offers stunning sunset views of the bay and a spooky tour of the jail! Named for the generations of fishermen who sold their catches at the harbor back in the day, the Wharf is now a tourist attraction. It is a great hub in the city where shopping, restaurants and entertainment venues are brought together to make for excellent areas for visitors. Make sure to keep your eye out for the famous Bushman street performer! You can catch the boat to Alcatraz Island from the pier also! Keep a lookout for sea lions! 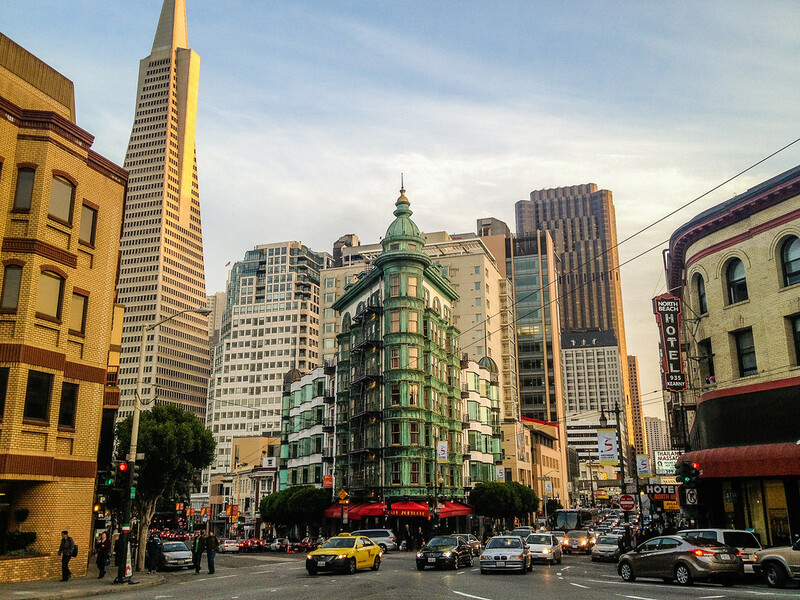 San Francisco is home to the largest Chinatown outside of Asia and the oldest in America, boasting an impressive display of markets, specialty shops and restaurants. If you’re lucky enough to be there in the fall, don’t miss the beautiful Autumn Moon Festival, a celebration of harvest, bazaars, dancing and mooncakes. With beautiful Chinese architecture, a wonderful atmosphere and the beautiful Chinatown Gate this is a great area to explore. Coqueta (Sensational Spanish): While it features a beautiful view, Coqueta’s focus is inside, to the bar and to the open kitchen. From excellent meat platters to tasty pintxos, this newly opened restaurant facing onto the bay serves up savory Spanish cuisine and fabulous cocktails. Nob Hill Café (Best Italian): Grab dinner at the authentic Italian restaurant, a staple for nearly 20 years. Local favorites include the creamy pesto pasta, roasted eggplant, veal cutlets, and sautéed sole. The ambiance is cozy, comfortable and intimate- be sure to call ahead with a reservation as it gets quite popular after five. Gracias Madre (Best Vegetarian): Offering wonderful organic vegan food in a Mexican style, this restaurant is enough to convince even a carnivore that not every meal needs meat in it. Shop My San Francisco Style Essentials! We’re off to San Francisco in September – this is super helpful! Can’t wait to go now.